We’re very happy to welcome two awesome Rails Girls into our office twice a week as they spend the summer programming for an open source project. Joining companies like Asquera, as one of the host companies for the Rails Girls Summer of Code, we’re opening up our workspace and dedicating resources to two women looking to become full-time programmers. Magda Frankiewicz (left) and Ute Mayer (right) coding away! As far as the project goes, Ute and Magda will be working on a tool for documentation testing. Nowadays, software documentation quickly becomes outdated and samples of code aren’t always verified. This is especially true for projects relying on integration with other changing software libraries. To fix this issue, Ute and Magda will implement a tool that tests code samples in software documentation. Their second project is to build a documentation website for the web framework Padrino. 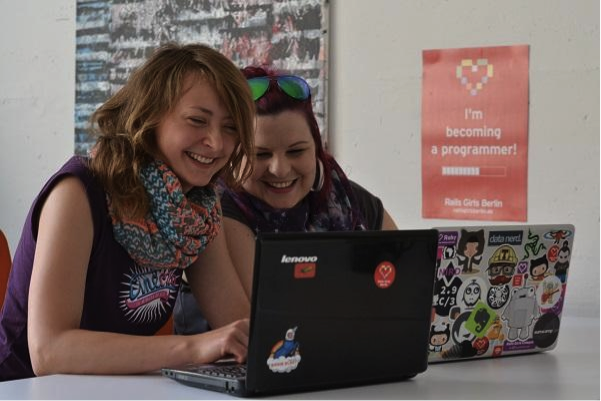 If you want to follow along, Ute and Magda are planning a weekly podcast to track their progress and will post updates to their website: http://code-padawans.de/.